The Night Cool research site demonstrates an experimental building concept that uses the cool, roof decking as a heat sink for cooling. Once the attic air mass is cooled to a specific temperature, it is then circulated to the interior space to off-set internal heat gains and reduce the overall air conditioner energy use. 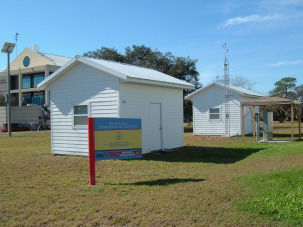 The experiment consists of two identical, wood frame constructed buildings with differing roof systems. The control building has a white metal roof on plywood decking and a vented, R-30 batt insulated attic. The experiment also has a white metal roof however, it is fastened to steel furring strips across the rafters and no plywood decking. The attic is sealed and over an R-30 SIP ceiling.